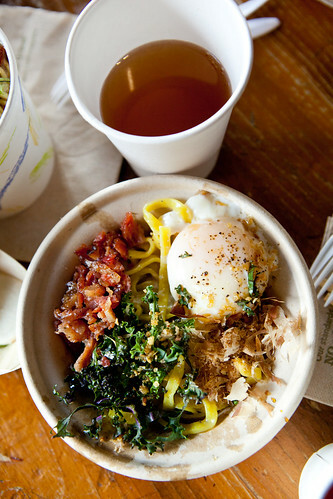 Whole Foods Smorgasburg recently chose Yuji Ramen, owned by Chef Yuji Haraguchi, as part of their pop-up vendor. I’m excited as my Asian self loves ramen, especially on chilly winter-like days we’re having here. Having lunch there on Saturday afternoon with a friend, we started with cups of cold soba tea ($2 each) and share a small bamboo boat of Tsukemono pickles ($3). 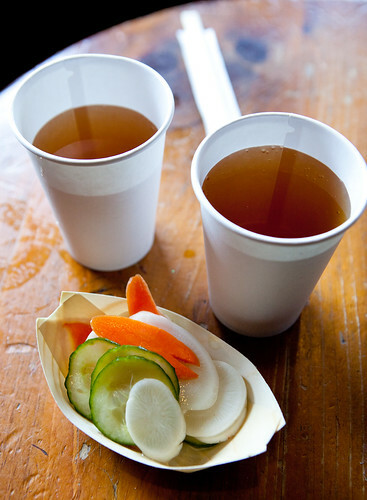 The tea vaguely reminds me of genmaicha from the subtle toasty, nutty flavors in the tea. The pickles were the nukazuke variety consisting of gently briny cucumber, carrots, and daikon or turnip to wake up our palates. 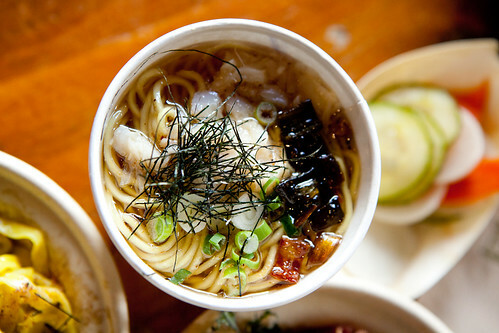 Chef Haraguchi’s niche with ramen is mazemen style. Mazemen means an almost brothless bowl of ramen (there’s a slight trace of broth). The reasoning behind this was the chef’s experience while he was in Japan that ramen is meant to be fast street food that’s meant to be eaten in minutes than the large bowl of ramen that is a formal meal that we (New Yorkers or more broadly, Americans) accustomed to. The other thing to note is the thin, wide, fettucine-like shape of the ramen noodles that the chef uses on his mazemen. It is not fettucini, as it has the springy, chewy bite ramen is known for but I don’t know what to call this particular ramen noodle since it’s not done before. So how were those composed bowls of ramen? 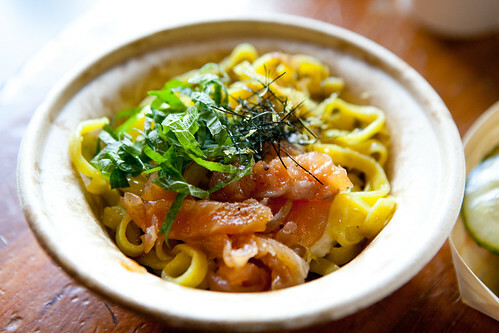 The salmon and cheese mazemen ($9) is composed of cured salmon, cream cheese, lemon is sort of a nod to New York’s love of the bagel, cream cheese and salmon. I didn’t really think this would work but it actually does. The tart, creamy cheese was a pleasant foil to the silky, fatty, salty cured salmon/ The lemon zest added a lovely brightness to the whole bowl. The bacon and egg mazemen ($9) does sound as luscious as it sounds. Crispy bits of smoky bacon, the yolky, poached egg created this incredibly, delicious rich mixture. The kale made this dish ever so slightly healthier (and it’s still tasty). 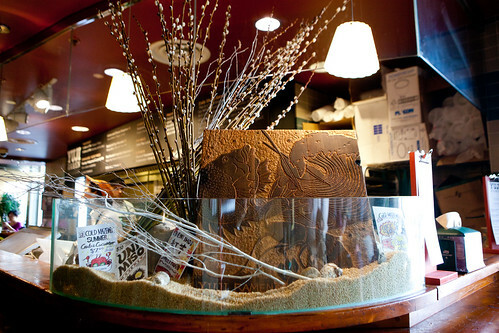 The daily shoyu ramen is one of the most familiar ramen you’ll encounter. Yuji and his team make fresh batches of shoyu broth every day utilizing the leftover bones from Whole Foods’ Bowery fish counter. You can taste the clean, freshness of the seafood broth (I think I saw bits of bass in my bowl) and it’s not salty at all (shoyu = soy sauce) but it has a deep depth of soy in there. 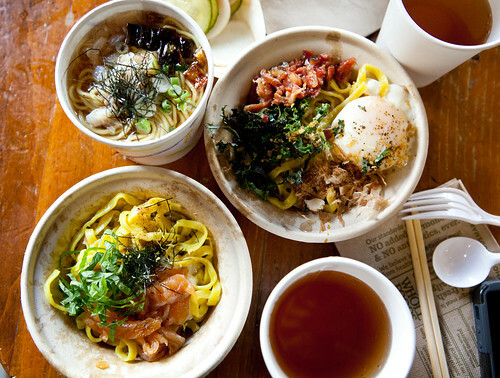 The ramen noodles are the ones you’d be familiar with and it’s still spring-y deliciousness. 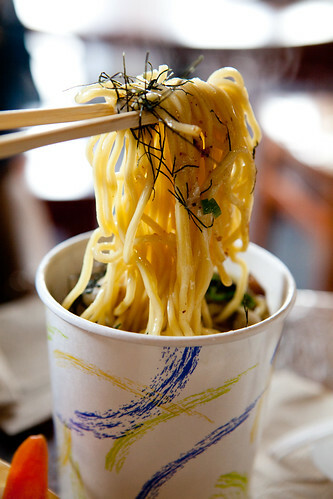 If you have yet tried Yuji Ramen’s ramen at the Brooklyn Flea Smorgasburg and refuse to leave the island (of Manhattan), head over to Whole Foods Bowery and have Yuji’s ramen. It’s seriously delicious and their portions aren’t huge that you’ll feel gross after eating it. (Unlike most ramen places I eat at, I want to take a nap afterwards.) This pop-up will be there until Sunday, May 12th. Might be worth noting that the fat, rude guy working behind the bar there beats up women. His name is Luke Davin and by attending Yuji Ramen you actively endorse domestic abuse, it could be argued.